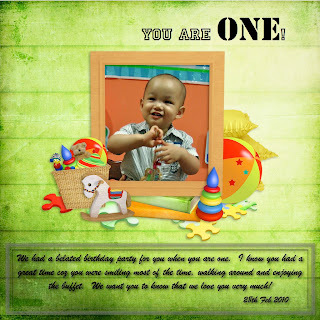 Beanie celebrated his FIRST Birthday with our families from both sides and one of our close friends. Beanie is very blessed, or rather all my children. They are surrounded by family members who love them and shower them with lots of attention. We ordered from the same catering from his full month celebration. 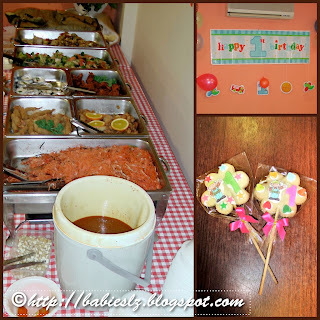 My cousins helped to blow balloons and decorate the function room. I ordered the cookies together with the cake and they were a hit! 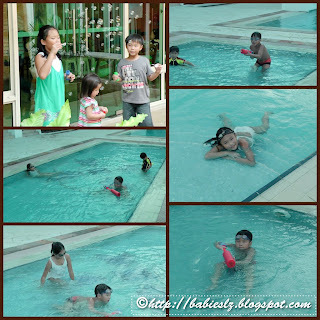 LZ thought of games to play at the party and we only managed to play 1 game coz they were extremely tired after the waterplay, bubbles fun and running around. We played treasure hunt, which L suggested. 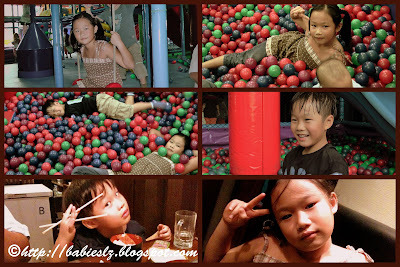 I had to 'shoo' them to the playground in order to hide the treasure, chocolates & candies. I think they had more fun than the birthday boy! Beanie, obviously was the star of the day! He was too busy walking around, being carried by our family members and eating! He ate so much sushi! He wanted me to carry him whenever he sees me and I was glad many of them took care of him while I was recording videos and taking pics. He likes to watch Bob the Builder and gets excited when he hears the song. 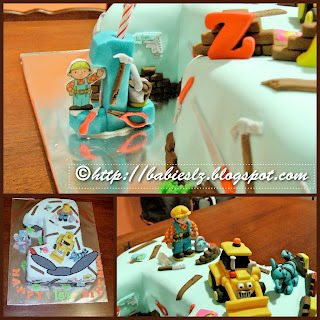 So for his birthday, I ordered a 'Bob the Builder' chocolate fondant cake for him. He was so HAPPY! Beanie sat on the table with the birthday cake and I think he enjoyed it! As it was a fondant cake, we didn't have to worry about him 'destroying' the cake. He was happily playing with the fondant Bob and broke Bob's head! Hahaha... Of coz I was able to put it back easily. The embarrassing moment was after singing the birthday songs, we forgot about the knife! Everyone waited while the helper went back to get one. While waiting, I think it was my SIL suggested letting Beanie play with the cake. She guided him how to 'dig' a hole on the cake! AND he ate it! So cute! 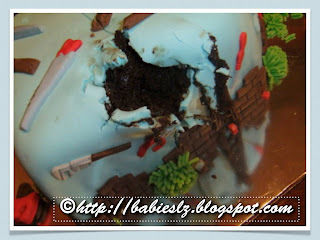 Before I end this post, here's the pic of what Beanie did to the cake! 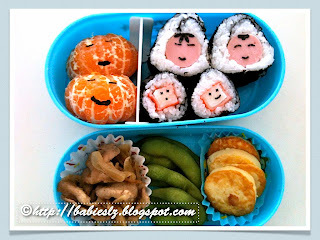 In the box: Orange, sushi with fish sausages & carbsticks, stir fried beef with onion, edamame & pan fried egg tofu. Z has been asking for sushi for a long time but his mommy been lazy. 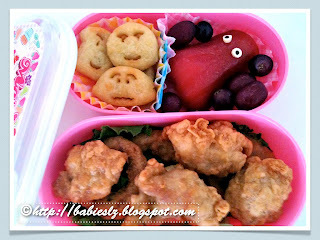 Today I finally did it for his lunch bento! Not that we have not been eating sushi, whenever we go to the supermarket, we do buy some for him or we have it at the restaurant. He was very happy and told me to prepare it again! Aiyo... My this boy never get enough of it. I have to note down about what LZ did few days ago (22nd Feb)... L & Z wanted to buy Beanie a birthday present each. My plan was to give each of them a small amount and let them choose what they want for him. Before we were ready to go, I saw both of them took out their savings from their piggy banks, started counting how much money they have and discussing how much they should bring along. I told them my plan but both declined and said they should buy Beanie's presents with their pocket money. Aiyo... They are soooo SWEET! I offered to pay for them first but again, they said no. They want to pay it themselves. I wish I have taken pics of LZ making the payments and how they choose the presents. Every time they see something that they think he likes, they showed it to me and we discussed but I told them not to get something too expensive and explained that it is the thought that counts. There were so many things that they wanted to buy for him but some were too expensive. Of coz the final decision goes to them, which was within the budget that I set. They brought quite a bit of coins and dollar notes along with them and I wanted to help them when they pay but they said no again. I can see that both of them truly enjoyed buying things for their baby brother and the excitement is written all over their faces! Hahaha... They struggled a little (counting the coins) and the cashier was very kind not to rush them and helped to wrap up the presents. I was glad we went on a weekday... I can imagine what it will be like if it was a weekends. They wanted to buy cute wrapper but I told them not to... I'm sure Beanie doesn't mind the wrapper from the store. 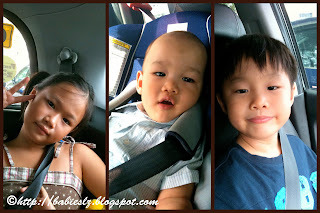 When we left the mall, both of them insisted to carry the little paper bag containing their baby brother's gift. They are definitely more excited than Beanie on his birthday. I know I have said it many times, but I can't help saying it again... I am very blessed to have my 3 babies who loves each other so much and I hope they will love each other as much or more when they grow up. My Beanie boy is ONE today! My little baby is growing too fast! No matter how time flies and how old he is, he is always my baby, just like LZ. I will writing his monthly update at a later time. For now, let's the pics say it all! As soon as Z got home from school, he gave Beanie the present (I will write another post on this). You can see Beanie was so engrossed in opening his present. After having our lunch at home, we picked L from school and we went to Polliwogs! When we first arrived, Beanie was busied looking around and wasn't that keen to explore. 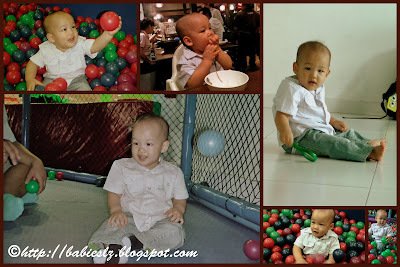 It was his FIRST time to a play gym. Once he warmed up, he was walking everywhere and climbing up the obstacles! LZ had lots of fun too! L met one of ballet friend and her brother. 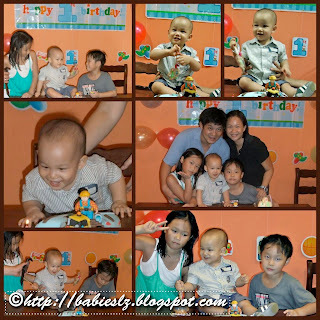 They all had fun running around and once awhile, they did remembered it was their baby brother's special day and spent time playing with him. After play, we went to one of our favourite Japanese restaurants for dinner. Besides having his home-cooked dinner, Beanie tried some of the food too, udon, sushi & edamame. 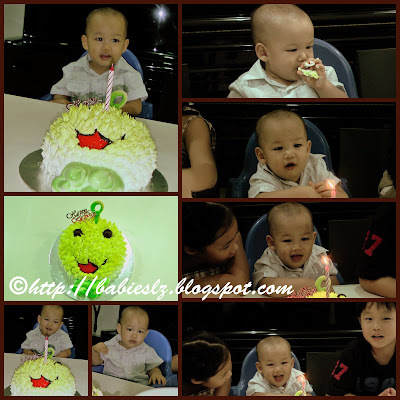 Before heading home, we bought him a birthday cake, CJ7! So cute right? He was so cool! 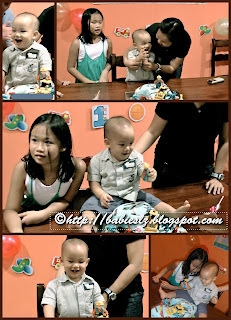 Smiling when we sang birthday song and helped himself to the cake. Last but not least, L gave the present to Beanie. Love the pic of her kissing him! I will post up a video of Beanie having fun when I have the time to edit it. 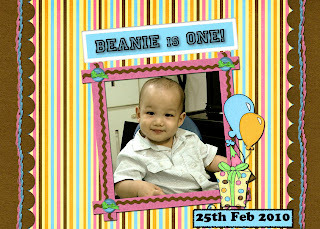 Happy Birthday my Beanie boy! We all love you very much! In the boxes: Potato faces, water apples, grapes, nuggets and onion rings. Today's lunch bento is super easy! Just put everything in the oven except the fruits. I was not in the cooking mood coz it's my Beanie's birthday today! Giving myself excuse to be lazy.. I know my princess will forgive me for that. Right Sweetie? Can you spot the bruises? Naughty mommy right? Asking people to spot the bruise. Don't think daddy will like it but what is done cannot be undone. To me, this is just part of growing up, I mean the bruise lah. I remembered LZ had quite a few bumps too at this age. 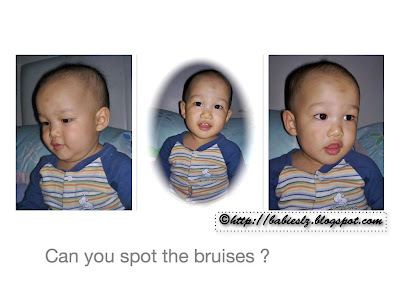 Once they were able to walk properly, I see less of the bruises. 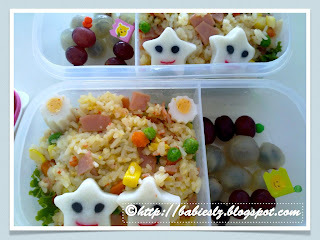 In the boxes: Fried rice with ham, crabsticks, fishcakes & mixed veg, longan and grapes.